The coastal regions and the Konkan belt are blessed with an abundance of tropical fruits in summer. With the onset of summer, you will notice the flowering fruit trees and immediately realize whether there will be a bumper crop. Sometimes the calculations can go wrong if the weather conditions change drastically before you actually get to see the ripened aromatic fruits. The mango is a delicate fruit and if there is a storm or heavy rain when the mango flowers have just appeared or when the fruit has just started developing then there can be a major loss of precious fruit. The raw mangoes are then collected and put to good use depending on the size of the raw fruit. There are so many varieties of mangoes. Some are valued for their sweet juice and others for their sweet pulp to convert them into jam, jelly, for canning and preservation or for daily consumption at home. Some varieties are especially grown to retain their raw superior quality to prepare pickles, jams or instant salted pickles for daily use. Korom is one such Instant Raw Mango Pickle. It is so simple, easy and can be made in a jiffy. It requires few readily available ingredients right in your pantry. 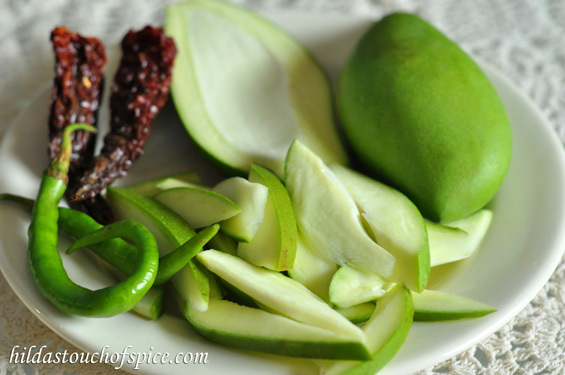 It is thinly sliced raw mango which is lightly spiced, crunchy and salty. It softens if you store for a long period. One does not have to wait for the raw mangoes to fall off the tree and then make it. You can simply pluck a fresh firm raw mango off the branch and prepare it instantly. It pairs well with Pez which is a traditional mid morning parboiled rice gruel meal (Ukade Tandool) in the villages of Goa. As a child, I remember many memorable summers spent in my ancestral home in Goa where I enjoyed picking and collecting raw mangoes in woven cane baskets when the weather was not very kind and there would be a dry storm with gusty winds or/and when the rain gods were angry and there would be torrential rains and thunder storms. There were times when my grandparents would intentionally choose to pluck the raw mangoes which were ready for pickling, to make jam or simply to prepare raw mango water pickle and Korom. Wash the raw mangoes well, drain and wipe them dry. Cut off the tops of each mango and split into two parts. Discard the seeds and scoop off the white pith if any. Slice the mangoes thinly with the skin intact. In a sufficiently large bowl, mix the sliced mangoes with all the remaining ingredients mentioned above. Let it marinate for an hour or two before eating. 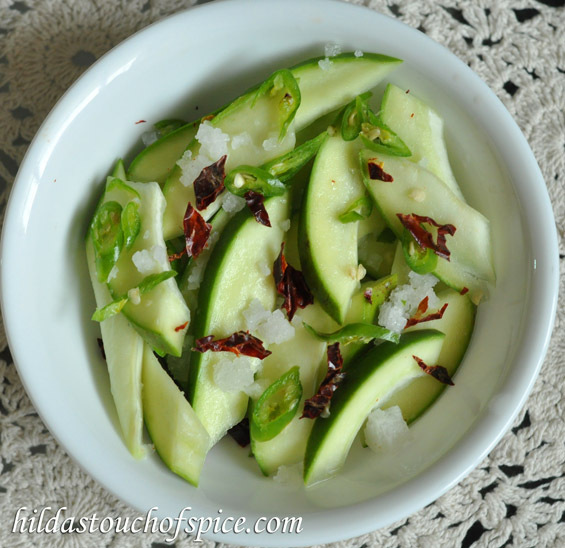 Serve with Pez/Kanjee or with simple regular Goan meals or with Indian thali meals. In case you wish to make a large batch then make sure you store it in clean and sterilized bottles or jars (bharnis). Avoid storing in metal and plastic containers to retain the quality & freshness of the pickle.